Moscow is the capital city and political, economic, cultural and scientific center of Russia. network with four international airports, nine railway terminals and an underground metro system. Moscow’s architecture and cultural aspects are world-renowned and tourists flock to the city every year to see the most famous sights, including Saint Basil’s Cathedral. 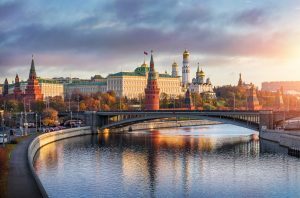 Moscow is the financial centre of Russia and has the lowest unemployment rate in the country. It is the home of the countries largest banks and holds the headquarters of many of the leading Russian companies. Economic stability has improved in recent years, with many industries experiencing growth. The construction industry continues to be a major focus of Russia’s economy. Residential construction has gradually increased and industrial construction is the most dynamic sector with a growth rate of 75 percent. The highest demand is for transport infrastructure, with major plans to develop hight speed routes between Moscow and St. Petersburg. Moscow is the home of Buildex, the trade fair for construction and interior materials and CTT Moscow, the trade fair for Construction Equipment and Technologies. Both of these trade fairs are organised by IMAG and offer internaitonal machinery and equipment manufacturers, as well as architects and interior designers, the opportunity to enter the Russian and CIS markets. One of the largest exhibition venues in the world, the Crocus Expo boasts 19 exhibition halls and hosts congresses, conferences, business forums, seminars and festivals. Csocus Expo was first opened in 2004 and is the largest business centre in Russia.